If you’re like me and never wear a bike helmet because you don’t want to mess up your hair, you may be interested in the latest biking safety technology: an invisible bike helmet. No, seriously. 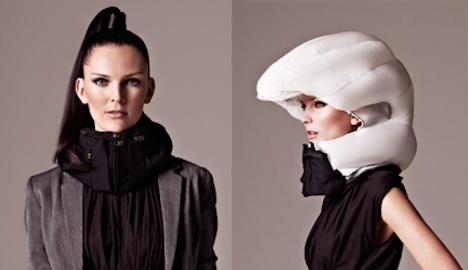 After 7 years of research, Terese Alstin and Ana Haupt of Sweden have developed an “invisible bike helmet” that is basically a chic looking scarf that activates an air bag when you’re in an accident. The Hovding costs $600 and only works one time. The Hövding uses battery-operated accelerometers and gyroscopes to detect motions typically involved in bike crashes. An inflator is triggered that fills the airbag inside it with helium. The airbag forms as a hood, protecting your dome from the impact of a crash. The price is a little steep ($600), especially since it only works one time, but if biking is your main source of transportation and you don’t want to deal with a sweaty, messy head all day at the office or running errands, it may be well worth it. Does this kind of wearable technology appeal to you?